Wow your friends and family with this fun appetizer! 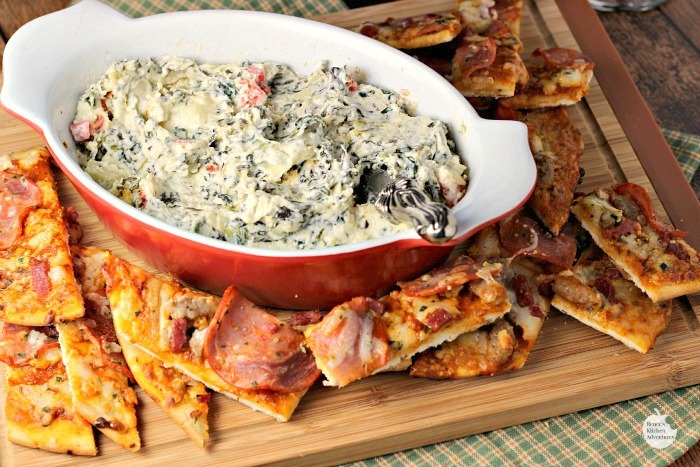 Hot and Cheesy Spinach Artichoke Dip with Pizza Dippers is a totally different, totally tasty way to enjoy pizza and dip. I know, I might be a little crazy for combining two appetizer/snacks into one super "mashed up" appetizer, but I have to tell you...this really works! It works because CALIFORNIA PIZZA KITCHEN® Crispy Thin Crust Oven Ready Pizza, Sicilian cooks up so crispy it can stand up perfectly to this classic cheesy, creamy dip and the flavors really compliment each other! I like to keep a couple of CALIFORNIA PIZZA KITCHEN® Crispy Thin Crust Oven Ready pizzas in the freezer for a quick meal or snack. They are a family favorite. The crisp crust is my favorite part. It reminds me of a crisp cracker. That's why I thought these pizzas would make a sturdy, tasty "dipper" for my cheesy Spinach Artichoke dip! This time of the year, we all need some quick and easy entertaining ideas. It seems like every week there is something happening...from Thanksgiving/Christmas/New Years, to holiday parties, and impromptu get-togethers, there are all kinds of occasions when appetizers are part of the menu. 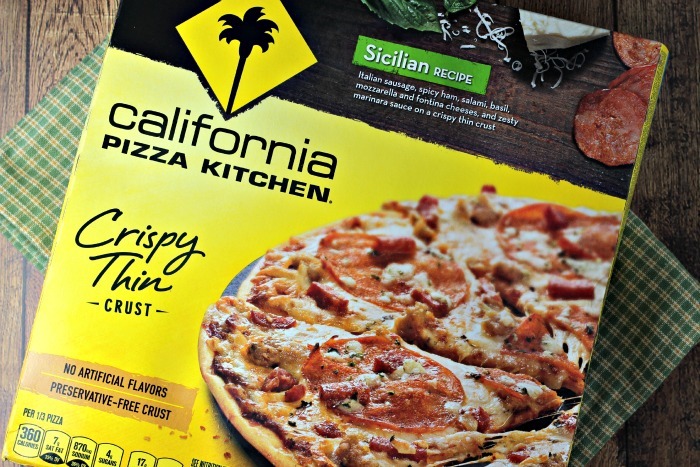 I love this mashed up idea, because CALIFORNIA PIZZA KITCHEN® makes it so easy and convenient! You can use any variety CALIFORNIA PIZZA KITCHEN® pizza you like. There are several varieties to pick from so it's easy to choose something to please everyone's tastes. 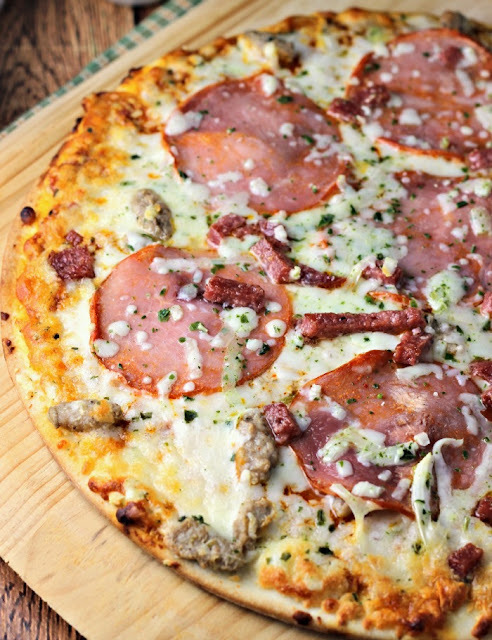 I used CALIFORNIA PIZZA KITCHEN® Crispy Thin Crust Oven Ready Pizza, Sicilian variety here, because the meats on the pizza complimented the flavor of the dip and my husband is all about meat on his pizza. I know it's not traditional Thanksgiving fare, but wouldn't this dip and pizza be great on your Thanksgiving menu this year? Thanksgiving (the holiday season in general) can be so stressful. I am always all for any semi-homemade recipe like this that makes my life easier and less stressful. I admit, dipping pizza into a dip is "gilding the lily" a little, but it's the holidays! It's traditionally a time to celebrate a little more than any other time of the year! Will you be dipping your pizza this Thanksgiving? What other dips would go well with pizza? 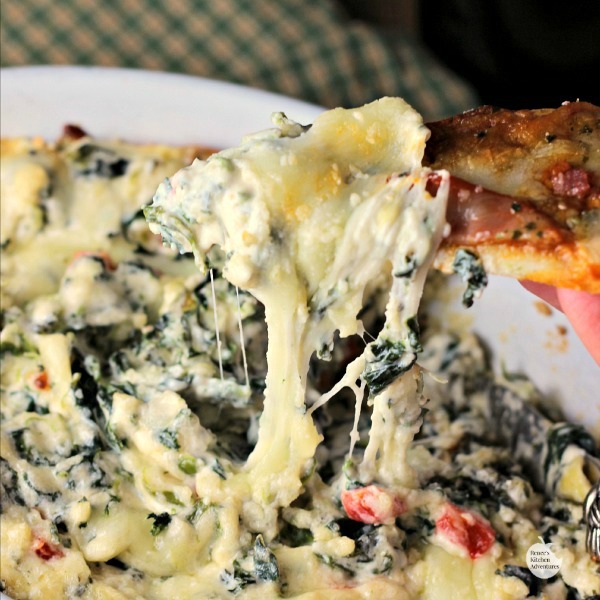 Warm, creamy, cheesy spinach artichoke dip meets thin and crispy CALIFORNIA PIZZA KITCHEN® Sicilian Style pizza for a fun, over the top flavor explosion! Bake pizza according to package directions. While pizza is baking, prepare the dip by combining all dip ingredients in a large bowl. Spray a one quart baking dish with cooking spray and spread the dip in the dish evenly. 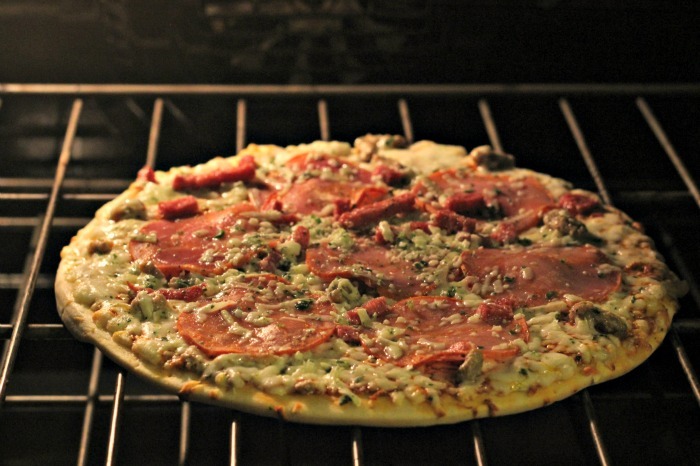 When pizza is done, remove from oven and turn oven down to 350 degrees F. Put dip in oven. Keep pizza warm while dip is baking by tenting with foil. 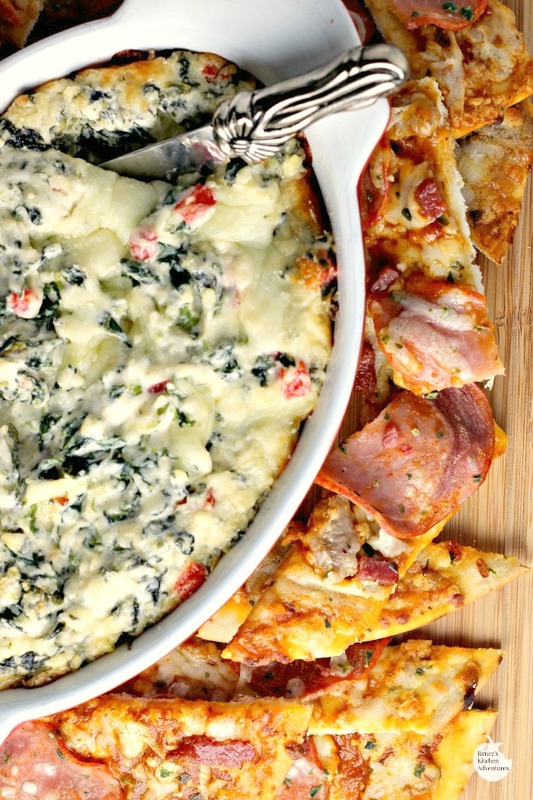 Bake dip for 20 - 25 minutes, or until hot and bubbly. Remove from oven. Cut pizza into strips. Arrange pizza around dip and serve as "dippers". Be sure to check out more delicious CALIFORNIA PIZZA KITCHEN® pairings on the Nestle Flavorful Moments Pinterest Board! 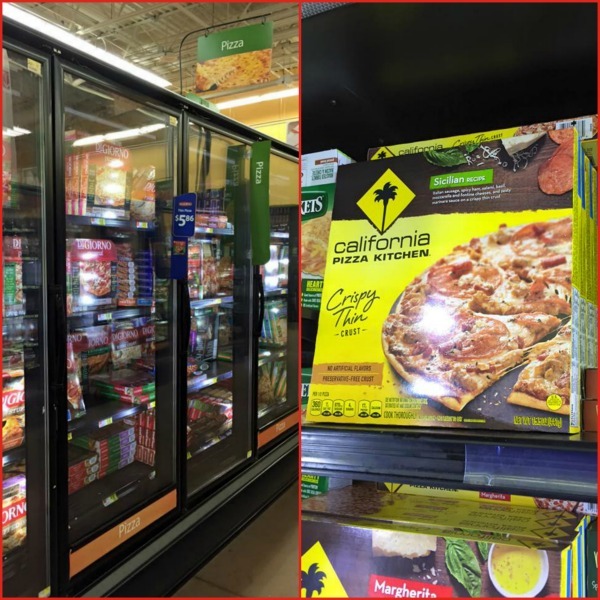 I found CALIFORNIA PIZZA KITCHEN® Crispy Thin Crust Oven Ready Pizza, Sicilian at my local Walmart, in the frozen food aisle! 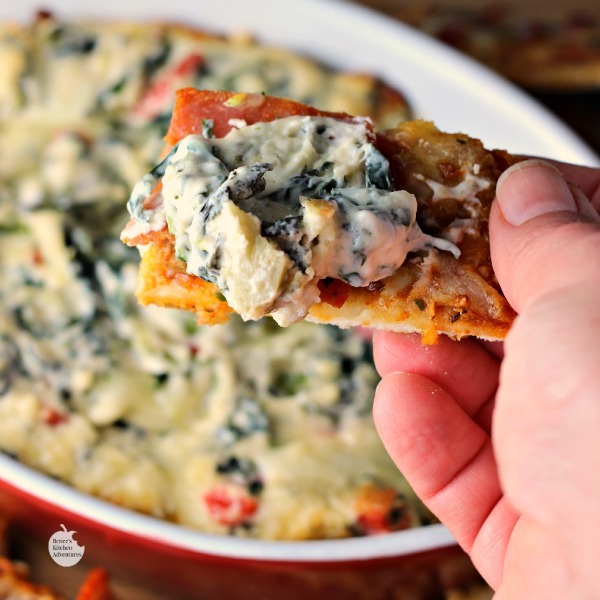 Combining pizza with spinach artichoke dip is genius! :) This looks delicious! I love that you used the pizza for dippers! How fun and creative. Love the dip too! What a fabulous idea to use pizza as a chip.